EUGENE CASSERLY, Senator of the United States from California, was born at Mullingar, county of Westmeath, Ireland, in 1822. His family was a branch of the O’Connors, and was formerly known as the O’Connor Casserlys, from a marked personal characteristic in one of his progenitors. His father and grandfather were both schoolmasters, and the latter a man of considerable influence among his neighbors and countrymen, with whom he took an active part in the Rebellion of ‘98, being at the head of one of the insurgent lodges whose ramifications permeated the middle and southern portions of the island at that time. He suffered severely in person on the disastrous termination of the attempt at Independence, and narrowly escaped with life. Patrick Sarsfield Casserly, the father of the subject of the present sketch, emigrated to the United States in 1824, bringing with him his family, consisting of his wife and little Eugene, then two years old. It is reported, we believe with truth, that the father went directly from the ship to the Court-room to take the preliminary steps towards becoming a citizen of his adopted country, before he had even prepared a resting-place for his family. Immediately thereafter, he resumed the practice of his profession, and for many years was at the head of a well known educational establishment in New York city. He was a man of superior intelligence and culture, and was known as one of the best classical scholars of his day in the United States. He personally supervised the education of his family, and being an enthusiastic in classical studies, he commenced to instill the rudiments of Greek and Latin into the minds of his children at a very early age. Thus Eugene was studying Greek at five years of age—a period when few children now-a-days have commenced the study of their mother-tongue. The boy showed wonderful aptitude for the task, however, and progressed in his studies so rapidly that at a very early age he was enabled to render material assistance to his father in compiling and editing a number of classical educational works, with which the name of the parent is honorably connected. For a number of years—in fact, until he closely approached manhood—Mr. Casserly assisted his father in the conduct of his school; but when he touched twenty, or thereabouts, he determined to launch into the world on his own account and carve out his own career. At the time we speak of, young Casserly’s character and literary attainments had attracted the attention of a number of influential persons, prominent among whom was Dr. Hughes, then Bishop, and subsequently Archbishop of New York, who was his early, steadfast, and most judicious friend. When, therefore, he had determined to commence the battle of life, he found friends not unwilling to aid him, and although the conflict was at first a hard one, success soon began to smile upon his efforts. Mr. Casserly’s first attempts were directed to journalism, and he obtained the position of editor of the Freeman’s Journal, then struggling for the position it has since obtained as the leading Irish Catholic journal of the Metropolis. His marked ability soon told on the fortunes of that paper, and in a short time he succeeded in placing it on a permanent basis. At the same time, he contributed freely to many of the leading journals of New York, Boston, and Washington, and became well known to the editorial fraternity as a rising member of the profession, and there can be no doubt that had he continued in it, he would long since have attained to eminence therein. His ambition, however, led him in another direction; and while yet engaged in the duties of editor, he entered himself as a student at law in the office of Mr. John Bigelow, then a leading member of the New York bar, subsequently one of the editors of the Evening Post, and more recently Minister to France from the United States. He was admitted to the bar in 1844, and was shortly afterwards chosen attorney of the corporation of New York city, a position of considerable emolument and patronage. The “California fever,” which prevailed so extensively throughout the Atlantic States in 1849, did not spare our young advocate, who hoped to find in a new country a shorter road to fame and fortune than that worn by so many wearied feet in the old States. In July, 1850, he started by the Panama route, and arrived in San Francisco in August of that year. The field of journalism promising well at the time, he brought to San Francisco the materials of a printing office, and in a short time after his arrival, in connection with Mr. Benjamin R. Buckalew, he started the Public Balance, a daily paper, which soon acquired in a particular manner the confidence of the community. His partner, however, was an uncongenial spirit, and after a few months of successful effort, they separated, Mr. Casserly changing the name of the paper to the True Balance, and subsequently to the Standard. At this time he was elected State Printer by the Legislature then in session, the first that met under the American flag. Business prospered, and the future looked bright, when the disastrous fire of May 3d and 4th, 1851, swept his whole property away in a night. His library alone was saved. Without means, but with a courageous heart, he faced the world anew. Mr. Casserly now determined to devote himself permanently to the law, and from this resolution he never afterwards swerved. His success was rapid and constant, and for many years, if not the leader, he certainly was second to no one practicing at the California bar. In early manhood, Mr. Casserly connected himself with the Democratic party of the United States, affiliating himself with the advanced wing of the organization then led by Silas Wright of New York. He has always been an active member of the party in California, as in fact he was one of its founders, and continued one of its most approved counsellors. This was particularly the case in the dark days towards the close of the great civil war, when at times it seemed as if the party, in the fact of constant and overwhelming defeat, was doomed to annihilation. It is hardly saying too much to assert that its preservation and its succeeding triumphs on the Pacific coast were due to the indomitable pluck and perseverance of Mr. Casserly, who would never consent to an abandonment of the struggle, even when it seemed most hopeless. When the troubles which eventually led to the outbreak of the great civil war first began to overshadow the land, Mr. Casserly threw his whole influence into the scale of peace; nor did he ever relax his efforts, urging strenuously and with all his power the necessity for concession on both sides, and the propriety especially of granting to the Southern States the guarantees they demanded. When, however, war was actually inaugurated, he promptly took his place by the flag under whose folds he had been placed in infancy by his father, and no less strenuously urged the necessity for supporting the Government with every man and dollar in the land. He lent his powerful aid in preventing the State of California from drifting into the vortex of secession that at one time threatened. He took an active part in the organization of the Sanitary Commission, an organization instituted to care for the wounded soldiers in the field. 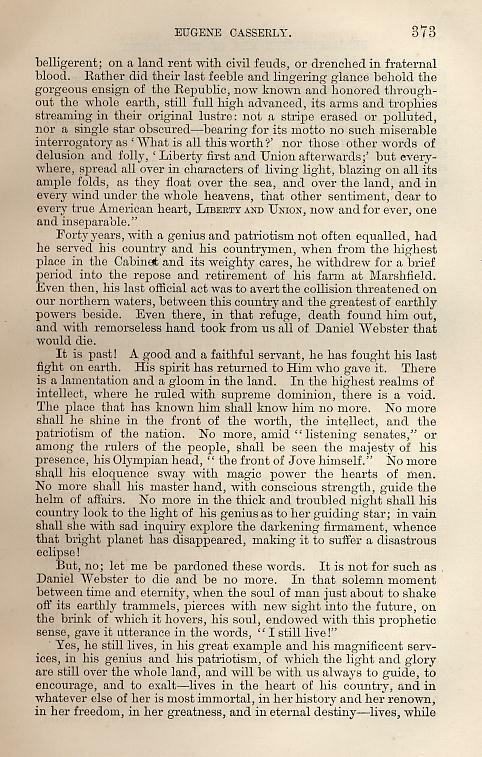 While thus doing his utmost to secure the supremacy of the Government, he nevertheless always pronounced in favor of holding the administration strictly to the cause for which the war was prosecuted—the restoration of the supremacy of the flag under the constitution, frowning at all attempts to engraft other and extraneous issues upon the struggle. He warmly advocated the election of Gen. McClellan to the Presidency in 1864, standing firmly on his “platform,” that the war must be prosecuted to an honorable peace, but that peace once established the States in rebellion should be at once restored to their position in the Union, with all the rights and guarantees they held under the constitution. Although the Democracy failed to elect their candidate in 1864, the wisdom of Mr. Casserly’s policy in putting the party on a patriotic constitutional basis was apparent within a comparatively short period, when that party achieved a complete triumph in the election of Governor Haight—a triumph which in turn placed Mr. Casserly in the most honorable position in the gift of the people of California. Immediately on the assembling of the Legislature in 1867, (the first in which the Democrats had held a majority for many years) he was brought forward as a candidate for the United States Senate, and, after a spirited contest, was elected by a large majority in December of that year, to serve for six years from March 4th, 1869, on which day he was sworn into office and took his seat. Mr. Casserly is a ripe scholar, a proficient in several foreign languages, and a master of his own. He is one of the best classical scholars on the Pacific, and is a Master of Arts of Georgetown College, D. C., an institution remarkably chary of its honors. He is a pleasing speaker, although not what could be called a popular orator, his voice lacking the volume requisite for addressing large open-air audiences, and the severity of his taste restricting him from the flights which many less gifted speakers attempt with ease. In a moderate-sized chamber he is very effective, and is always a close and exhaustive logician. 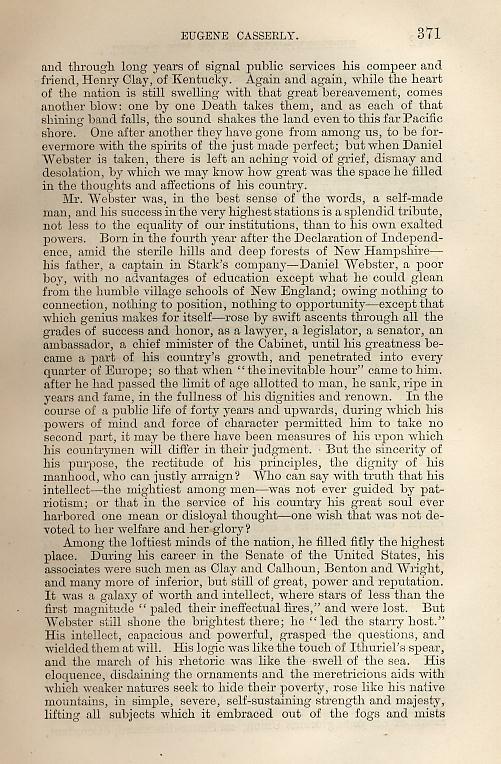 Some of his efforts at the bar are models in their way, and he is admirably adapted to the field he now occupies in the Senate of the United States. He is a man of medium height, with a well-knit frame, and a clear, though deep-set brown eye. The size and conformation of his head indicate a large and well-balanced brain; while his temperament is ardent yet well restrained. His hair is prematurely white. 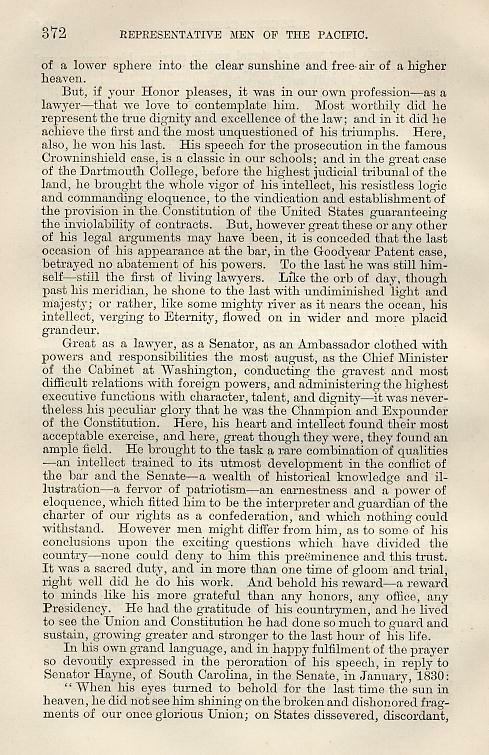 His private life is as spotless as his public character, and no better testimonial to his worth need be sought for than the fact that his selection to the Senate was hailed by the best men of both parties as a triumph of intelligence and virtue, and that a partisan press—more violent in its bigotry perhaps than any in the Union—was silent, or spoke but to say that his party dare not reject him. 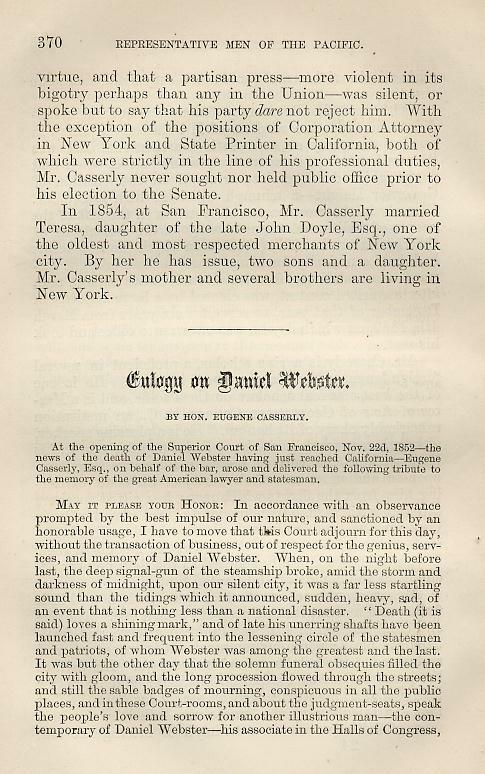 With the exception of the position of Corporation Attorney in New York and State Printer in California, both of which were strictly in the line of his professional duties, Mr. Casserly never sought nor held public office prior to his election to the Senate. In 1854, at San Francisco, Mr. Casserly married Teresa, daughter of the late John Doyle, Esq., one of the oldest and most respected merchants of New York city. By her he has issue, two sons and a daughter. Mr. Casserly’s mother and several brothers are living in New York. Source: Shuck, Oscar T., “Representative & Leading Men of the Pacific”, Bacon & Co., Printers & Publishers, San Francisco, 1870. Pages 365-370.